Fun and whimsical invitation featuring faux confetti gold foil. Invite guests to your Stock the Bar party with this farmhouse-style invitation! Eucalyptus Greenery Leaves Chic Engagement Party Invitation. "Modern Chalkboard & Script Engagement Party Photo" design by Titan Studios. Love is Brewing Beers rustic invitation. Changing your listing for a couples shower, engagement party, wedding BBQ. 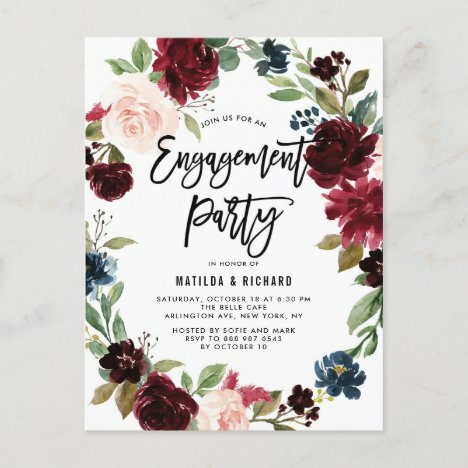 Trendy Typography | Chic Marble Engagement Party Invitation by Eugene Designs. Gold glitter, rustic wood, and mason jar string lights engagement party invitations. Funny chalkboard engagement party invitation with faux gold foil typography and love heart, arrow and engagement ring. Hand-drawn champagne and beer artwork on a navy background.